2 Clubnights + Manchester's Premier electronic music label. We're really excited to be returning to our Northern home, Manchester. We've spent the last few years working closely with AnalogueTrash who've helped us with everything from releasing V3 of our compilation to keeping an ear on the ground to what our fans want to see on stages. This Summer we're putting together an intriguing and diverse lineup of some of the best UK artists across the darker side of electronic music, from one artist's sensuous mix of electronics, guitars and drums to a more spartan and unsettling electronics duo and a maybe even a dash of witch house for good goth-pleasing measure! 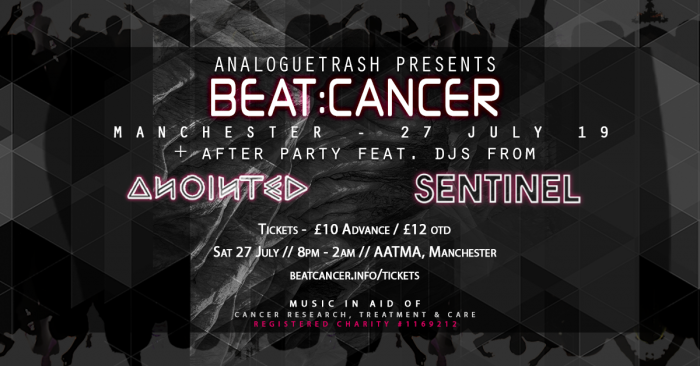 Held Aatma​ in the ever vibrant Northern Quarter and hosted by AnalogueTrash​ this promises to be a brilliant night, for a great cause!" 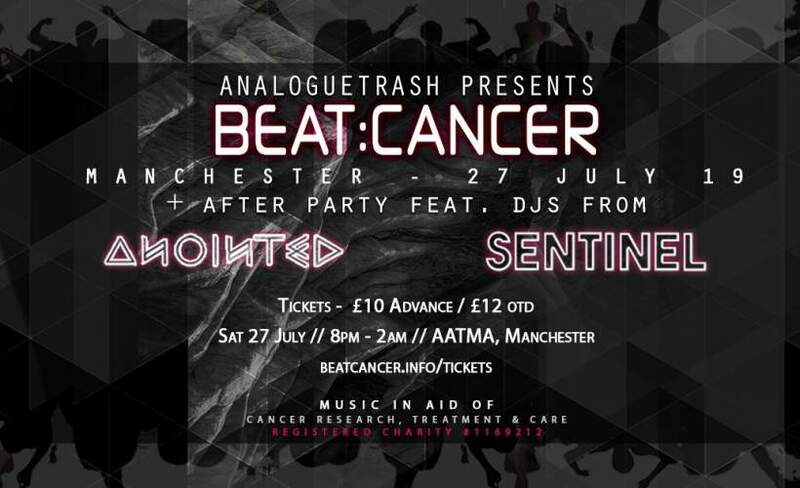 To complement the diversity of the lineup we are joining forces this year with not one, but two great Manchester club nights to run the afterparty - Anointed​ and Sentinel Manchester​ DJs will be hitting the decks to keep people dancing the night away. Obviously what we do is about raising money, both for pursuing progress in development of treatment with centres such as Yorkshire Cancer Research or care facilities such as the Sue Ryder Thorpe Hall Hospice. But to best achieve this we've always believed that we have to nurture this family of artists and fans - allowing everyone to express in their own way - and enjoy showing cancer the middle finger, whether from stage or on the dance floor!